A complete copper-alloy early Anglo-Saxon annular brooch frame. This frame is roughly circular in shape and measures c44mm in external diameter and cc28mm in internal diameter. This frame has a rectangular pin hole, measuring 4mm by 2.5mm in size, it has rounded corners. There are traces of corroded iron around this pin hole and on the opposite side of the frame, this is presumably the remains of an iron pin, now missing. The front face of the frame is decorated with five evenly spaced bands of decoration, each band consisting of six transverse grooves. Along the inner and outer edges of the front face inbetween these five bands of decoration there are boarders consisting of small indented circles. The back face of the frame is undecorated but again has corroded iron adhering to it, probably from the original iron pin. 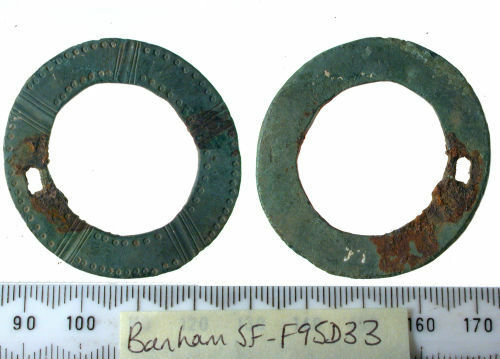 Similar flat annular brooches with stamped decoration have been discovered in Icklingham, Suffolk (West 1998, 169, fig 52 and McGregor and Bolick 1993, 88, no 10.31). Their distribution is most heavily concentrated in the Anglian territories and they date from the late 5th to the late 6th century.